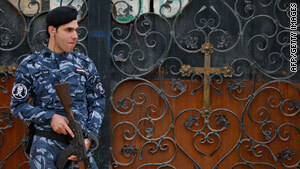 A security officer stands guard Friday at a Baghdad church. Baghdad, Iraq (CNN) -- A roadside bomb Friday killed three Shiite pilgrims walking in the Iraqi capital in advance of the holy day of Ashura, authorities said. Another 20 people were wounded in the attack, officials with Iraq's ministry of information said. There have been attacks against Shiite pilgrims each year as they make a pilgrimage to Baghdad and Karbala for the holy day, which commemorates the martyrdom of Imam Hussein, grandson of the Prophet Mohammed. Hussein died in Karbala in 680 in a battle that marked a defining point of the schism between the two main branches of Islam -- Shiites and Sunnis. Iraq has a majority Shiite population. Close to two-thirds of the population is Shiite, with most of the remaining primarily Sunni. In other violence Friday, gunmen killed three teachers who also work for Iraq's census committee in Mosul while they gathering information from families, Interior Ministry officials said. Also Friday, a group of Christians and Shiite Muslims got into a fight over decorations in the town of Bartela during their coinciding religious observances, an Iraqi Interior Ministry official said. Iraqi troops were deployed to the town east of Mosul after five people from each side were injured. The fight began after a group of Christians -- a small minority in Iraq -- pulled down black flags in the town to mark the Shiite mourning period, the official said. Security and local government officials held an emergency meeting to calm the situation.